I had such a great time with Sarah and Eric for their engagement session the prior Spring and I was SO excited to photograph their wedding at St. Nicholas Banquet Center! 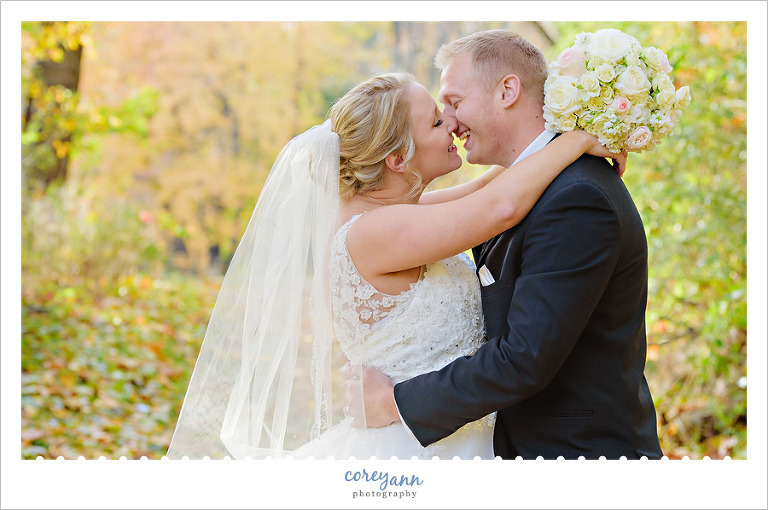 November weddings can be tricky when it comes to weather and leaves. Luckily Sarah and Eric were blessed with one of the most beautiful fall days and the leaves were still quite beautiful with enough on the ground to give everything color. They had lots of time in their timeline so we were able to make a few stops for photos and take advantage of the beautiful day! I cannot convey how much fun these two were. They were SO easy going and went with anything I suggested – or literally had thrown – at them. They both had massive smiles all day! I’m sure that a major factor was their love but I have to give a shout out to Sarah for smartly wearing comfortable shoes for her wedding day. I can’t tell you how many brides of mine are ready to throw their shoes even before the ceremony starts! I’ve had a LOT of smart brides lately with comfy shoes and it makes a HUGE difference ladies! I’ve never had a groom sing an entire set at his own wedding and I had to toss this in here because it was SUCH a treat!!! Eric is so dang talented! Thank you both SO much for trusting me to capture your beautiful day! 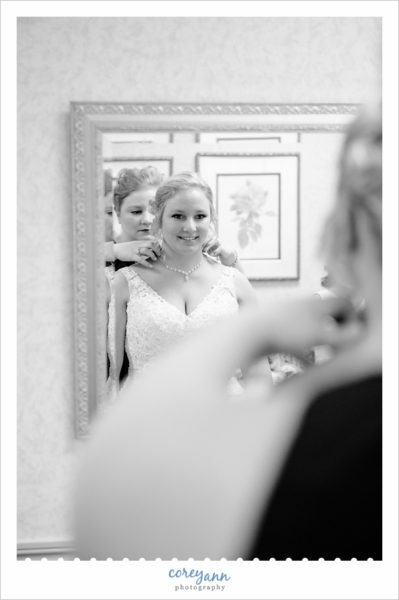 Sarah’s sister helped withe the final touches as they got ready for the wedding. 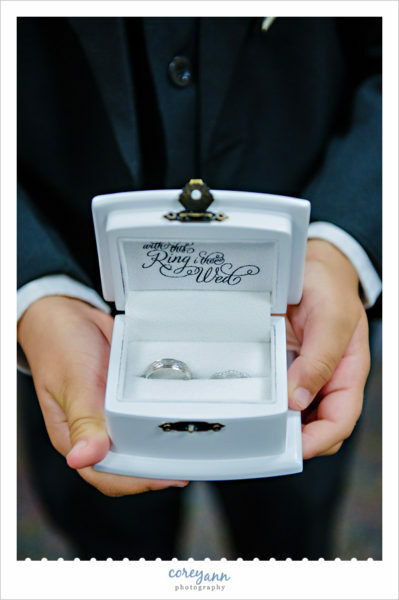 I loved the box they gave to their ring bearer for their rings! Eric was entranced when he first laid eyes on Sarah. 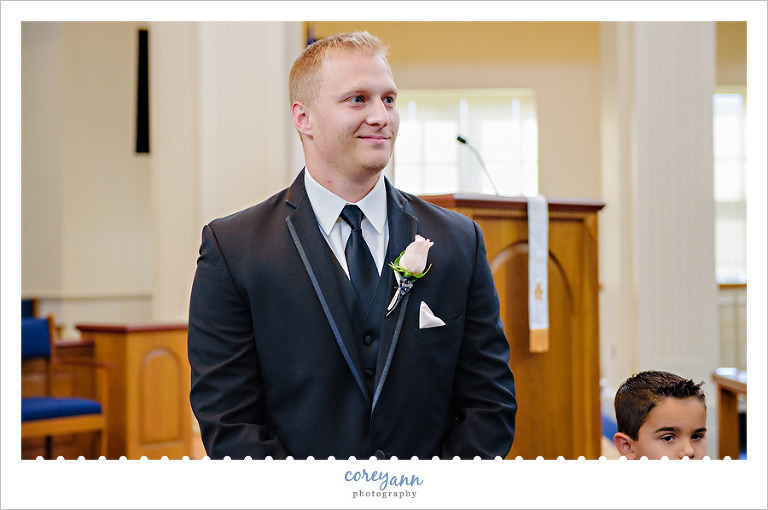 Sarah’s father expertly guided her down the aisle. Isn’t First United Methodist of Akron a beautiful place for a wedding ceremony? I’ve said it before and I know I’ll say it many times again, I love bubbles for wedding exits! The outside of the church is quite beautiful and we were able to take photos there with the wedding party! What a gorgeous wedding party!! I loved the navy colors with the pink touches! We made a quick stop at these beautiful arches at The University of Akron that are perfect for a stop for wedding photos. I adored the beautiful bouquets that Pam’s Posies created for the ladies! The pink and white roses were gorgeous! We ended up at Little Turtle Pond and there was a path off the parking lot that was full of beautiful color! Again, these bridesmaids looked amazing in their long navy bridesmaid dresses! I loved that they were all different! How dapper are these guys? The grey suits with the pop of navy were amazing! Their bridal party helped me with this photo and I can’t express how much I loved it! The leaves fell PERFECTLY for this photo! Classic portraits are always a favorite though. Such a gorgeous spot, if you need a wedding photo spot in the fall in Akron, I highly recommend this little nook! Around the corner we made a quick stop here for more photos with the gorgeous leaves and lake! We arrived early enough at St. Nicholas Banquet Center to get photos of the empty ballroom before everyone arrived for the cocktail hour. I loved their decor with the lanterns on the reception tables and especially the custom light with their names! Their favors were home made honey!! Seriously I could have played in here taking detail shots for hours. Such a beautiful spot with gorgeous lighting! You know it’s going to be a fun night when they dip upon their entrance! Mobile James had a “dancing in the cloud” feature during the first dance which was SO darn cool! Smoke filled the dance floor and they looked like they were dancing in the clouds. They had a choreographed first dance and it was perfect! Next up were the toasts and they were also perfection. As dinner was finishing up Eric played a set for his guests and he is SO darn talented! Everyone was gushing about this all night long. Then came the parent dances which were so darn sweet. The garter removal was a hoot and it came with a twist! After the garter was removed often DJs do the “put the garter on the girl who caught the bouquet” game. Sometimes that game is super awkward – especially when girls are wearing shorter dresses. In a fun twist Mobile James had a role reversal where the girl put the garter on the guy’s leg! LOVE! Once the festivities were over everyone flooded the dance floor and shook their tailfeathers all night long! Of course I had to end with some rings! And what gorgeous rings they are!